Earlage is growing in popularity in this region of the country because it allows the production of a relatively high-energy feed product, which can be harvested, stored and fed much like corn silage, using the same types of equipment that are used to produce corn silage. With the growth in corn acreage in North Dakota, many producers are exploring harvest options that reduce cost or spread the harvest window. For livestock producers, harvesting corn as earlage is an option that eliminates grain-drying costs and produces a product that makes excellent feed for ruminant animals. Earlage is ensiled corn grain, cobs and, in some cases, husks and a portion of the stalk (depends on the harvest method). 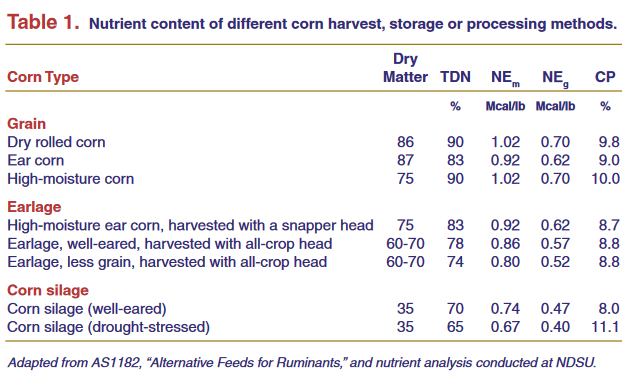 Earlage is higher in energy than corn silage with similar protein content, but it has lower energy than dry or high-moisture corn grain (Table 1). Earlage works well in a variety of cattle diets, including growing and finishing diets for beef cattle and feed for lactating dairy cows. Earlage also can refer to ensiled corn grain, cobs, husks, shanks and a portion of the stalk harvested with an all-crop header raised to a height at which the ear and stalk material above the shank is harvested (Figure 1). Figure 1. Earlage produced with an all-crop header and stored in a bunker silo in southeastern North Dakota. ■ Snaplage: This term describes ensiled corn grain, cobs and husks typically harvested with a forage harvester equipped with a corn snapper header so that only the ear and a portion of the ear shank is removed, chopped and ensiled (Figure 2). Figure 2. Harvesting snaplage in northeastern North Dakota using a self-propelled forage harvester and a snapper head. ■ High-moisture Ear Corn or Corn and Cob Meal: This refers to corn grain and cob material that is harvested with a combine set to return the grain and a portion of the ground cob to the hopper. For the purposes of this publication, the term earlage will be used for all variations, and the same principles apply to all products. ■ Turning corn grown as feed into earlage requires no drying costs. ■ Harvesting the corn crop as earlage will increase the dry-matter yield by approximately 20 percent compared with just harvesting the grain because you are capturing the cob, husks and a portion of the ear shank and stalk. ■ Earlage can be harvested before dry corn grain normally would be combined, lengthening the harvest window. ■ Longer-season corn varieties can be grown with potentially higher yields, with estimated yield increases of 3 to 5 bushels per acre for every day of relative maturity. ■ Earlage is very palatable and mixes well with many other feeds and forages. ■ Earlage is easy to feed, and cattle stay on feed more consistently with earlage in the ration due to the digestible fiber present in the cob and husk and the positive effect of the cob “scratch factor” on rumination. ■ Harvesting corn as earlage provides a longer residue grazing window for cattle. ■ Enough residue remains for erosion control. ■ Earlage must be used as feed for ruminant animals. No other markets exist. ■ If harvested late, the cob is low in digestibility, resulting in a feed with lower energy content relative to dry grain. ■ Earlage is often lower in protein than other corn grain products. ■ Losses due to spoilage and shrink can be excessive if good silage-making principles are not followed. ■ Lower volumes of corn residue remain following earlage harvest, and that which does remain is lower in nutritional quality for grazing compared with corn residue remaining after grain harvest. ■ Exclude oxygen. Pack earlage properly (just as you would corn silage). ■ Be sure to cover the earlage pile with plastic to prevent oxygen penetration. The plastic should be held down with tires or other material to maintain a tight seal. ■ As with corn silage, inoculants may be a valuable addition during harvest and ensiling. Make sure the crop’s moisture content is correct before chopping. Sixty to 65 percent dry matter, with 35 to 40 percent moisture (for the harvested material), is best. If the earlage is harvested while the corn is too wet, dry-matter yields will be reduced and seepage losses will be higher. If earlage is harvested while the corn is at less than optimum moisture content, it will not pack well, which will lead to excessive spoilage. At harvest, cob material will be higher in moisture than grain. With earlage, the biggest problem usually is harvesting the product when it is too dry. Earlage can be harvested in a number of ways. Many custom forage chopping operations have equipment to produce good-quality earlage. The most common harvesting method is to use a snapper head on a forage harvester equipped with a kernel processor so that just the ear, cob and husk are harvested (Figure 2). The kernel processor should be set to crack all of the kernels and break the cobs into pieces smaller than your thumb nail. Another option is to use an all-crop header on a forage harvester and take the upper one-third of the stalk along with all the ears. This option will produce more tonnage, but the energy and protein content of the feed will be lower due to the inclusion of the stalk. Some producers use conventional combines to produce earlage by setting the machines to break up the cob and return it to the grain tank. The combine owners manual may contain instructions for setting the combine for the harvest of corn and cob meal. These adjustments may include slowing the rotor speed, opening the sieves and removing the cover from the auger in the grain tank because this product tends to bridge easily. This product is generally referred to as corn and cob meal. Earlage can be stored in most structures typically used for storing corn silage, including bunker silos, plastic silage bags and oxygen-limiting storage structures. The volume to be stored, rate of harvest, amount fed and length of storage are factors to consider in choosing a storage method. Bunker or Trench Silos: These are generally the best option for storing large volumes of earlage. Earlage going into bunker silos should be packed with tractors equipped with dozer blades and covered in much the same manner that corn silage would be packed and covered in a bunker silo. Proper packing and covering is critical to reducing spoilage losses and ensuring a good-quality feed product for your livestock. Bunker silos are best when the storage volume and rate of feeding are high. A concrete floor and sidewalls will reduce spoilage and provide a solid surface for loading feeding equipment. The face of the bunker should be kept fresh to avoid excessive spoilage losses and heating of the earlage, which will reduce nutrient availability. Narrower bunkers are recommended when the feeding rate is lower because the amount of material on the face will be more appropriately sized for the feedout rate. All bunker, trench or drive-over piles of earlage should be covered with plastic to create an anaerobic environment and minimize spoilage. Plastic should be inspected periodically and any holes or tears should be repaired. Plastic Silage Bags: Figure 3 shows a large-capacity bagging machine filling a plastic silage bag with earlage. Bags are filled with a specialized bagger that stuffs the bag. Pressure can be varied to accommodate different feed products. Baggers are available for rent or purchase. Bags come in different sizes and lengths. Figure 3. Storing snaplage in plastic silage bags. Oxygen-limiting Structure: Glass or steel silos, and possibly concrete stave silos, can be used for storing earlage. Prior to storing the product in an oxygen-limiting storage structure, be sure to contact the manufacturer to determine if your silo can handle the weight and density of the material. Earlage is denser than corn silage. Consequently, ensuring that your silo and its unloading equipment can handle the extra weight prior to filling the silo is important. The nutrient content of earlage varies depending on the harvest method. The more shank, stalk and trash present in the earlage, the lower the energy content will be (Table 1). Corn crops that did not reach maturity due to poor growing conditions (for example, lack of heat units) will have lower proportions of grain and subsequently lower energy content compared with earlage produced from fields grown under good growing conditions. 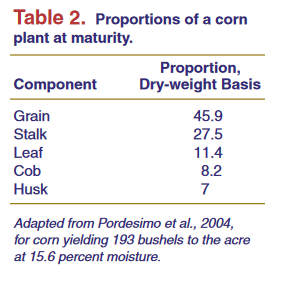 Table 2 gives the proportions of the corn plant at maturity. The grain makes up approximately 46 percent of the weight of the plant (depends on yield), while the cob and husk make up 8.2 and 7 percent, respectively. With snaplage, the proportions at harvest are approximately 78 percent grain, 14 percent cob, and 8 percent husk and shank. Earlage will have a lower proportion of grain and greater amounts of stalk due to differences in the types of material that are harvested when an all-crop header vs. a snapper header is used for harvest. Because the cob makes up a significant portion of the weight of the finished product, remember that cob digestibility drops rapidly during maturation of the corn plant. Data published by Pioneer Hi-Bred indicates cob digestibility dropped from 65 to 44 percent from Sept. 13 to Oct. 4 in its field studies. This change in nutrient content is particularly important for dairy producers but likely also will impact energy content in beef cattle feeding scenarios. The energy content of earlage varies with harvest method and the amount of roughage ensiled with the grain (Table 1). Harvest methods that collect a larger proportion of stalk (for example, all-crop headers) will produce a lower-energy earlage product than harvest methods that only ensile grain and a portion of the cob. Consequently, the inclusion level in the ration will vary depending on the energy content of the material and desired level of performance. In addition, earlage produced from corn with lower grain yields also will be lower in energy. Earlage is lower in protein than corn grain, and rations based on earlage will require adequate protein supplementation to achieve desired performance levels. Earlage has very few, if any, feeding limitations. However, as with any novel feed, earlage should be introduced into the ration gradually. The fact that it contains a significant amount of roughage makes it a very safe feed with little risk of acidosis. For most rations, earlage can replace a portion of the grain and roughage. However, in beef cattle finishing rations, the energy content of earlage generally will not be high enough for it to serve as the sole source of concentrate. Rations can be balanced with combinations of earlage, protein supplement and grain to achieve desired levels of performance. A nutrient analysis prior to feeding also is recommended. Rations can be formulated based on the laboratory analysis to be sure the nutritional requirements of the livestock are met. Earlage can be priced a variety of ways. Most of them are based on some function of the corn price. When pricing earlage relative to dry corn grain, one must account for the amount of corn in the earlage, assign some value to the roughage in the earlage and adjust for moisture content. The harvest method also comes into play because it affects the amount and type of roughage present in the earlage. The multitude of factors involved can make pricing earlage somewhat complicated. Earlage can be used in a variety of beef and dairy cattle diets. Earlage is an excellent way to harvest and store a nutritious and palatable feed product economically. Livestock producers can work with Extension personnel or their nutritional consultant to determine the optimum level of earlage to include in the ration based on the desired level of livestock performance.